In one of his first tweets in 2018 President Trump announced his goal to halt U.S. foreign aid to the Islamic Republic of Pakistan. It’s not surprising, especially after Pakistan refused to cooperate with U.S. authorities when asked to question a terrorist linked to the kidnapping of a Canadian-American family that was recently rescued in October 2017 after having been held captive for five years. Historically, the U.S. has provided $255 million in military aid to Pakistan, which the New York Times reports is apparently being re-considered after the Pakistani government refused to allow U.S. interrogators to question a captured al-Haqqani terrorist. We can no longer be silent about Pakistan’s safe havens for terrorist organizations, the Taliban and other groups that pose a threat to the region and beyond. These killers need to know they have nowhere to hide – that no place is beyond the reach of American arms. And, the Trump administration withheld $50 million in military aid to Pakistan because of Pakistan’s inability or unwillingness to help destroy– and in some instances, actually working with, instead of against, the Taliban and the Haqqani Network. Interestingly, the prisoner that Pakistan refused the U.S. to interview was tied to the kidnapping of a Canadian-American family who was held hostage by the Haqqani terrorist network for five years. 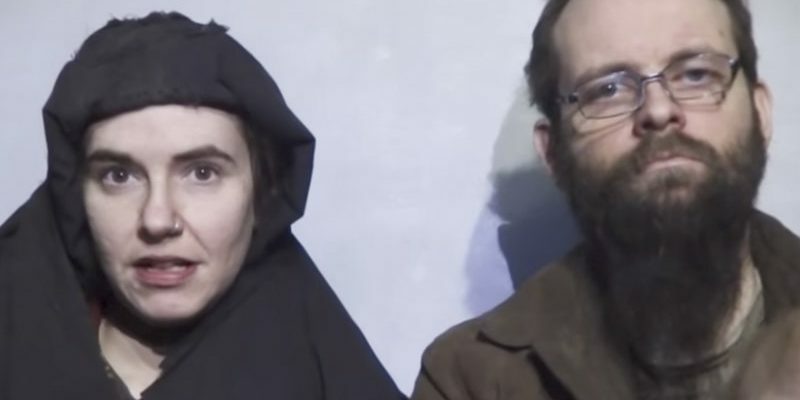 Canadian Joshua Boyle and his American wife Caitlan Coleman were captured in 2012 and rescued in October 2017. Their three children were born in captivity. Boyle said his wife had been raped and their infant daughter was killed because the terrorists forced an abortion. At times they endured conditions like being kept in a cell the size of a bathtub– underground. NPR told their incredible story. The U.S. government has expressed concern about the relationship between the Pakistani government and the Haqqani Network, which it suspects has made deals with in the past. In other words, the terrorist network allows special favors to the Pakistani government in exchange for protection, which of course the Pakistani government denies. If a relationship does exist between the terrorist network and the Pakistani government it could help explain why the family was not released earlier. And, why a proof of life video was only posted after Trump’s election. It took ten months after President Trump was elected for the family to be released. They are now recovering in Ontario. The Pakistani military still appears to not be cooperating with the U.S. authorities.